These terms and conditions (T&Cs) regulate the business relationship between you and us. No person under the age of 18 years may purchase goods; please ask your parent or guardian to place your order. 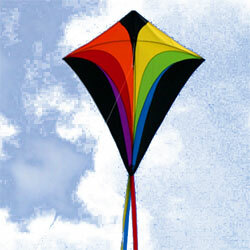 We are: Kites Ireland You are: visitor to our web site - our customer. In this agreement: "Carrier" means any person or business contracted by us to carry goods from us to you. "Content" means information in any form published on our web site. 2.1.2. in any event to you as a buyer or prospective buyer of our goods. 2.2. Goods advertised may not be available. 2.3. We shall acknowledge your order by e-mail or phone upon receipt. However, no contract exists between you and us for the sale of any goods until we confirm that payment has been received and your order has been despatched. At any point up until then, we may decline to supply the goods to you without giving any reason. 2.4. We may change these terms from time to time. The terms that apply to you are those posted here on our web site on the day you order goods. 2.5. All descriptions, weights and sizes of goods are those of the original manufacturers and you may not rely on their accuracy. Accordingly, any such description shall not form part of this agreement. 2.7. If we owe you money (for this or any other reason), we will refund you as soon as reasonably practicable but in any event no later than 30 days from the date of your order. 2.8. Goods are at your risk from the moment they are picked up by the carrier. 3.2. Banking charges by the receiving bank on payments to us will be borne by us. All other charges relating to payment in a currency other than Euro will be borne by you. 3.3. Any details given by us in relation to exchange rates are approximate only and may vary from time to time. 3.4. You will pay all sums due to us under these terms by the means specified without any set-off, deduction or counterclaim. 4.1. You agree that you have provided, and will continue to provide accurate, up to date, and complete information about yourself. We need this information to provide you with the goods. 4.2. We will use our reasonable endeavours to respond to any point of dissatisfaction by you, provided you contact us within three months of purchase. 5.1. Deliveries will be made by the carrier to the address stipulated in your order. You must ensure that someone is present to accept delivery. All registered deliveries are insured against physical loss or damage. Check the parcel in front of the deliverer. If you observe any damage, describe them on the receipt of delivery. Do not forget to date, sign and keep a double of the receipt - otherwise the insurance will not apply. 5.2. If we are not able to deliver your goods within 30 days of the date of your order, we shall notify you by e-mail to arrange another date for delivery. 5.3. We may deliver the goods in instalments if the goods are not available at the same time for delivery. 6.1. We have no knowledge of, and no responsibility for, the laws in your country of residence. 6.2. You are responsible for purchasing goods which you are lawfully able to import and for the payment of import duties and taxes of any kind levied in your country of residence. 7.3.3 at your risk and cost. 7.5. If you do not return the goods to us within 7 days of you telling us you wish to cancel, we can not give refunds. 8.1. We or our content suppliers may make improvements or changes to our web site, the content, or to any of the goods, at any time and without advance notice. 8.2. You are advised that content may include technical inaccuracies or typographical errors. 8.3.5 compliance with any law; 8.3.6 non-infringement of any right. 8.4. Our web site contains links to other Internet web sites. We have neither power nor control over any such web site. You acknowledge and agree that we shall not be liable in any way for the content of any such linked web site, nor for any loss or damage arising from your use of any such web site. 8.5. We are not liable in any circumstances for special, indirect or consequential loss or any damages whatsoever resulting from loss of use, loss of data or loss of revenues or profits, whether in an action of contract, negligence or otherwise, arising out of or in connection with your use of our web site or the purchase of goods. 8.6. In any claim against us our liability is limited to the value of the goods you have purchased in the contract which is the subject of the dispute. 9.1. Title, ownership rights, and intellectual property rights in the content whether provided by us or by any other content provider shall remain the sole property of us and / or the other content provider. We will strongly protect its rights in all countries. 9.2. You may not copy, modify, publish, transmit, transfer or sell, reproduce, create derivative works from, distribute, perform, display, or in any way exploit any of the content, in whole or in part, except as is expressly permitted in this agreement. 9.3. You may download or copy the content only for your own personal use, provided that you maintain all copyright and other notices contained in such content. You may not store electronically any significant portion of any content. 10.1. You agree that you will not, and will not allow any other person to, violate or attempt to violate any aspect of the security of our web site. 10.2. You agree that you will in no way modify, reverse engineer, disassemble, decompile, copy, or cause damage or unintended effect to any portion of our web site, or any software used on our web site, and that you will not permit any other person to do so. 10.4.5. taking any action in order to obtain goods to which you are not entitled. 10.5.4. the infringement by you, or by any other user of your computer, of any intellectual property or other right of any person or entity, or as a result of any threatening, libellous, obscene, harassing or offensive material contained in any of your communications. Nothing in this agreement or on our web site shall confer on any third party any benefit under the provisions of the Rights of Third Parties Act. We are not liable for any breach of our obligations resulting from causes beyond our reasonable control including strikes.